But I can't help but notice that Marina is luckier than Najib over this bodoh-bangang thing; her supporters came quickly to her defense and told her not to respond to the chap who called her the STUPID. Not quickly enough [by then Marina had dragged her dad, totally unnecessarily I must say, into it with the angry retort: "If I'm stupid it must be genetic"] but Najib did not have too many people supporting him to start with. 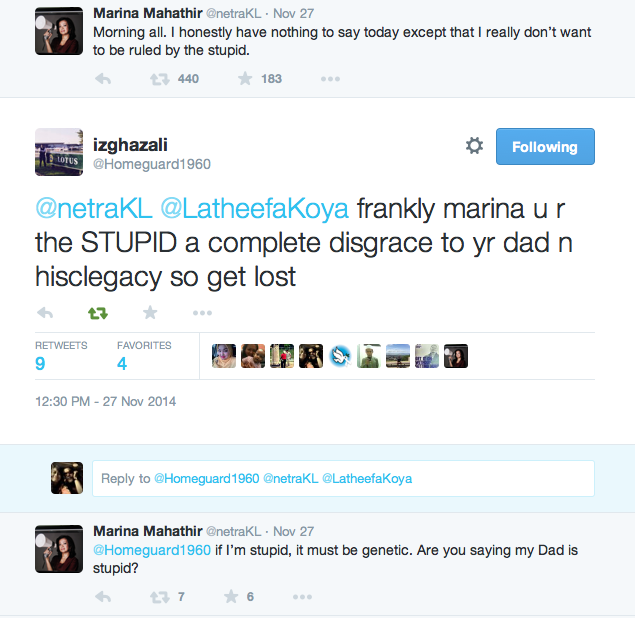 The Straits Times totally ignored the equally angry response by @izghazali towards Marina's "speechless … the stupid". 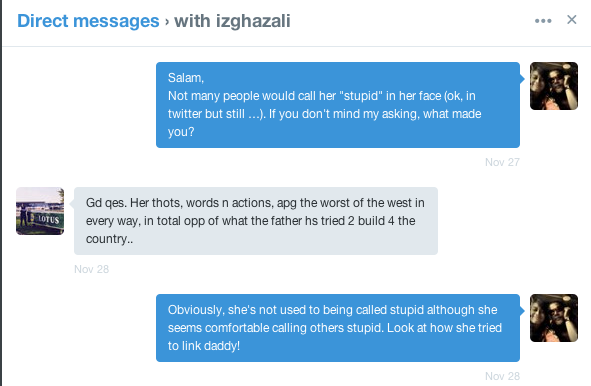 I don't know if I was stupid or what but I had to "talk" to this @izghazali chap so I sent him a direct message. And he responded! Now, as for the bangang comment made by the Prime Minister in his closing speech at the Umno General Assembly, I hope he does something now that he's been blessed with the knowledge. He can start by getting rid of the "handlers" responsible for those traitorous pro-Umno bloggers! Seems to me that you are taking a not-so-subtle dig at the Singapore Straits Times. Of course, you and that newspaper have a history of sorts, haven't you? And you are not exactly a fan of Singapore. So, any comments you make which bring in a Singapore angle could perhaps be considered as biased or skewed. Never mind, that's your issue to sort out with the Singapore S T. Man to man, or journalist to journalist, with due professional courtesy. 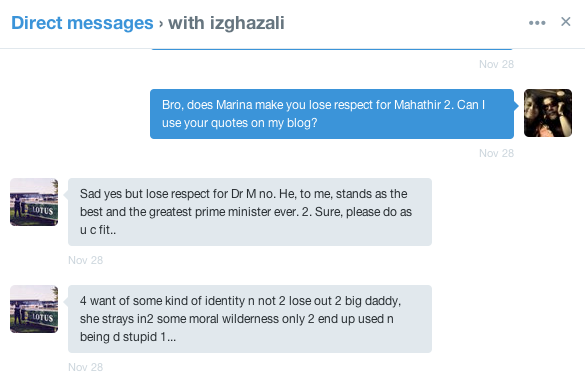 As for Mr Ghazali, what's his beef? 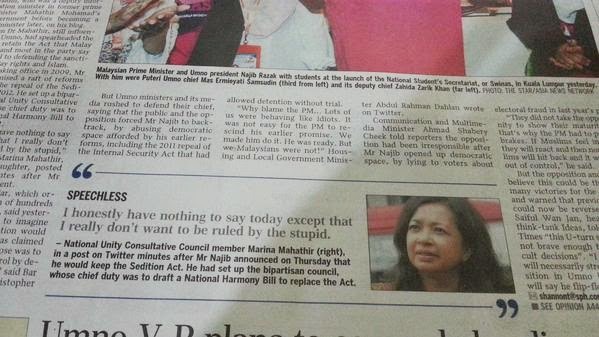 Marina Mahathir wrote a commentary in which she made certain remarks. Controversial, maybe, but not haram or seditious (the "in word" these days, it seems). Certainly there is nothing new in some Malaysians believing that there are idiots and dummies in both the BN parties and the Opposition. Some of the views and statements that have been flying around lend credence to this. Does Mr Ghazali deny this? Is he claiming that everything is hunky dory in the country? If Mr Ghazali insists on having his views heard, other Malaysians can do likewise, no matter how unpalatable they may seem. When u embrace "biawaks" then ur stupid moron ! - bodoh bangang di buat-buat ! Its not genetic, its remnant(s) that is (are) useless or simply called it waste ! Bahawa pepatah Melayu itu mengingatkan - Kenapa mendukung biawak hidup ? Maaf kata, melayu yang melawan arus perdana Melayu itu, memang mereka biawak hidup dan PM kita 'LUPA' mengingatkan diri nya tentang jeritan HIDUP MELAYU ! Kita takut bahawa Melayu itu sentiasa di bodoh bangangkan setelah puluhan tahun merdeka, masih berkemelut dengan hak-hak yang sudah termaktub, di lerai-punahkan akibat perbuatan bodoh bangang sendiri ! Maka yang berkeinginan sentiasa memerhati dan tumpang sekaki.... hidup ke Melayu ??? Marina, it is not genetic. Your dad ruled Malaysia for 22 years and sedition act stayed. If you consider your dad is smart and he kept sedition act for his 22 years of rule, then those who oppose the sedition act must be the opposite of smart, which is obviously stupid. So Marina, if it is genetic, then you should be supporting sedition act. The PM's secretary seemingly incharge of bloggers must be shitting in his pants that now this issue of Umno's paid bloggers has been exposed bu none other than the PM himself. The secretary is not shivering so much due to the expose per say but more due to his fictitious list of bloggers that was allegedly used to siphon out funds. We shall demand for an audit of the actual amount of funds that is being ditched out or siphoned by culprits within the PM's inner circle. Pm maybe genuinely upset because he was made to understand 200odd bloggers are being taken care of. In actual fact a big chunk are phantom bloggers. Dear, It's not genetic but generated. It is not stupidity but more of bebalism. You don't know if you are Stupid? Of course you are! To be stupid just for the sake of getting a Datukship is being stupid to the Max!! That is the one and only way to impede someone from calling the repugnant and avaricious Mahathir from being called stupid. In fact he should be called a dictator who hung on to power when the American or the Chinese presidents can only stay as head of state for no longer than ten years. In 22 years what has he done for this country ? Why wasn't he able to achieve the 30% wealth reserved for the Malay community ? When he was able and busy building the many white elephants as if this country cannot do without them. Or was it because all there weren't the mega commissions in them ? Or was it because the 30% has to be shared by millions of poor Malays and that it will not be able to make someone to become the richest man in Asia ? No doubt with that achievement Malaysia will be a better and peaceful place to live than what it is to day ? Wasn't that the real reason behind the introduction of NEP ? The repugnant and avaricious ex-PM wasn't elected to build all the white elephants but on the main tickets to have the poor Malays elevated to a better level or more satisfied level of living. He was able to do everything that only provided mega commissions but cannot achieve peanuts or nothing for the million poor Malays. Now you know why the majority of the Malays failed to vote for them and to add insult to injury these very people are turning to the Chinese for support. The people this repugnant and avaricious ex-PM who once said he did not need the support of the Chinese to be elected. I am sure from all the policies he had implemented in the 22 years as the PM he still believes that to be true but just doesn't have the audacity to express it publicly. And if Najib wishes to reverse that trend he should have the percentages of the population of this country reflected in everything he does ! Exactly wht i was thinking. Some only write pornos under politics bcoz ranking is more important than political impact. "Today Dr M is once more reading the pulse of the nation quite correctly while the Prime Minister is woefully mistaken. Najib is a silver spooner who, like the Tunku, is similarly divorced from the Malay grassroots and clueless." Madam m does not seem to be able to stand on her own two feet. Madam m seems to have to remind all of us that she is big daddy's "product". Although some might consider Mahathir as one of the outstanding leaders vis a vis the Third World and the West Madam m is no where to match. Infact lots are disappointed that he raised one like Madam m who does not have any iota of the passion and verve of many others who have been inspired and moulded by Mahathir's dynamism and challenge to the West. Madam m only seems to be the spokesman for some of these western fueled groups who want to put their filthy noses into everything in our society as if they are the authorities in everything - with their slanted and devious take on our nation's matters. Wha? t Marina try to say? She is Clever like father. Remember Newton & Einstein never reproduced as Einstein again. Apart from your atrocious grammar, what exactly are you trying to say? That Marina Mahathir doesn't have a right to speak her mind? Even her Dad wouldn't deny her this right. Did he ever do so? If you can't rebut Marina's views by logical and reasoned arguments, then do not resort to cheap shots. At the end of the day, Malaysia needs the West. The West doesn't need Malaysia. Unless, of course, you want Malaysia to be pally-wally with the likes of China, India and Russia? Instead of calling the bloggers bangang because of the "friendly fire", it would be better to find out the reason behind the firing itself. Most if not all the time, it's because there are bangangs in his midst. Bloggers who agree with Barisan do so only because they believe Barisan is doing (mostly) the right thing for the country. The love for Barisan is borne out of love for the country. If elements in Barisan is seen to be inclined towards personal interests and fail to show love for the country, fires need to be fired, friendly or not. Barisan should do itself a favor; find the real bangangs who are ruining their cause and do their own firing. Cant you read MrGhazali msg properly ? His reply was direct to Marina and Bro Rocky . Clear n concise . What r u then ? Another Moron like that Marina !!! what else do you call a person who relate his/her 'stupidity' to its genes...i wonder..
Whatever this repugnant and avaricious Mahathir is trying to project please do not judge him or even address him or his descendants as Malays. Because they are not Malays, it is being proven again and again they are mamaks. Once again you can't call an Eurasian a European or an Asian and you can't call a mamak an Indian or a Malay. have made that possible for them to be called Malays. Only Allah has the divine right who are to be borne Malays and not the Umno dorky and the schmucks have that right. That is why they need to pass rules to circumvent for the imposer to be called Malays. One cannot become a Malay because of what one can eat or wear, you are either borne a Malay or you are not ! Anon 8.53am - can got give english lessons ah? we don't want french lesson please. Do you think genuinely good leader need stupid and paid bloggers...good for nothing. No better jobs to do ka? Go back to kampong and be a rubber tapper.